The Rutherford is equipped with a classy deep blue frame, cream wheels & logo, and a silver drivetrain. The quality components work seamlessly together and provide the rider with a very comfortable, sturdy, and quiet ride. Impressively adaptable to a variety of terrains, the Rutherford is a perfect way to get around town and an excellent fixie regardless of whether you're a seasoned rider or a first-time fixie buyer. You'll be impressed with the ride quality and with its reserved classy looks. Frame: The new double-butted 4130 Chromoly steel frame is more durable and corrosion resistant. 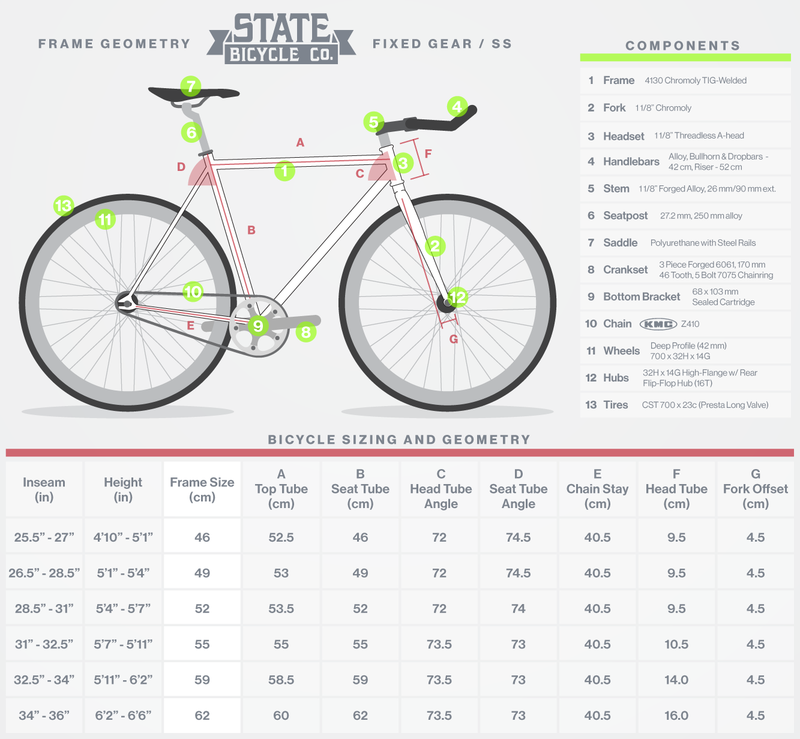 This frame is commonly used in higher quality fixie bikes and lasts much longer than regular frames. Additionally, the frame only weighs slightly more than its aluminum counterparts, so it adds the durability without adding the bulk. Wider Wheels: The 26mm rims will help you avoid pinch flats and improve your cornering while riding. The bike now also houses a lower profile to reduce weight. New rounded-urban saddle: The bike includes an improved standard saddle for increased riding comfort. Purchasers of last generations core line requested that the standard saddle be improved for greater comfort and State Bicycle Co delivered. Die Cast Drop-Outs With Internal Chain Tensioners: The new 4130 Core Models now feature strong die-cast drop outs with internal chain tensioners for easier tensioning and improved aesthetics. Sealed Bearing-Hubs: A significant upgrade to the core line is the new sealed bearing wheel hubs. These new hubs are smoother, more durable, and last longer than unsealed hubs. Safety checks should cost approximately $10-$20 from your local dealer.